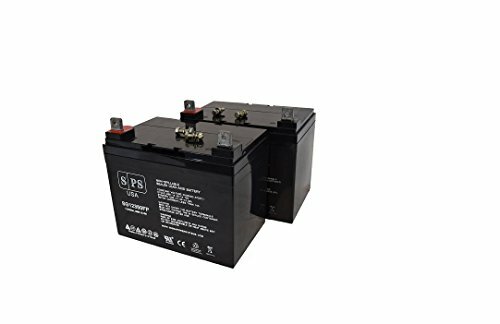 Two 12V 35 Ah rechargeable SLA batteries with FP type terminals (each with dimension 7.7 x 5.16 x 6.69 inch). Replacement batteries supplied by RightPrice Batteries for Golden Technologies GC 321 Wheelchair Batteries U1 battery are of high quality, designed to meet or exceed original OEM specifications. They were manufactured by ISO certified companies. Spent batteries from Golden Technologies GC 321 Wheelchair Batteries U1 battery have to disposed properly as per local and federal regulations. Ask about our free battery recycling service. Replacement batteries forGolden Technologies GC 321 Wheelchair Batteries U1 battery carry one year full warranty and 30 days money back guarantee. UL (Underwriters Laboratories) and CE (Consumer Electronics) Safety Certified (logos are officially printed on the products). We only purchase products that are safety certified by UL and CE. TWO PACKAGES -- You will receive 2 separate packages. Sometimes the post office delivers this on separate days. Golden Technologies GC 321 Wheelchair Batteries U1 battery set have one year warranty when used under normal conditions. Specifically designed for deep cycle applications - Scooters,Wheelchair,Solar, Emergency Lights,Etc. Absorbent Glass Mat (AGM) technology creates superior performance. Charge voltages are marked on the battery for cyclic and float applications for your convenience.